Dedicated to exploring the music and lives of Hindustani musicians. There are currently two short biographies of Ustad Shaik Dawood Khan online (www.tablaustaddawood.com and www.chandrakantha.com/dawood/) that I drew from for this biography. My other sources for this paper were interviews I was able to do in the summer of 2008 in Hyderabad, India, with his son, Shabir Nisar. In 1916, the year Ustad, Shaik Dawood Khan was born, India was in the midst of assisting the British in fighting the First World War. Two years earlier, in August of 1914, Britain declared war on Germany and began sending Indian troops, over a million of them, to Europe and the Middle East to help their cause. India’s economy suffered tremendously and, as in many times of war, inflation occurred. Dawood Khan was born into an India ruled by the British and struggling for its Independence. In 1915, the freedom fighter Tilak re-entered Indian politics in the Congress party, and India persisted in its road to become independent from British Rule. During the late nineteenth century, there were also many movements in the arts that related to emerging classes and political struggles over representation. Two musicologists in particular were at the forefront of musical revolution involving Hindustani music in particular: Bhatkande, and Palushkar (Bhakle 2007). Hindustani music was undergoing a transformation from court music to “North Indian classical music.” Since there were no more courts following the fall of the Mughals in 1857, hereditary Hindustani musicians were required to find new avenues for seeking patronage to support their music. Some continued to flourish in the court of the Nizam in Hyderabad, but most had to be adaptive in their strategies to survive. There was a new interest in theatre arts (including music), especially Marahastra, West India. It was through these performances that Dawood Khan was first exposed to music as a child. Although he did come from a musical family, his parents were extremely fond of music and took him to the theatre often. Dawood Khan was born in the state of Maharastra on December 16, 1916. His life as a non-hereditary musician was a product of a new India, one that was rapidly changing from exclusive, self-contained groups, to a nation desiring to establish its independence and an identity separate from colonial rule. If Dawood Khan had been born during another period in Indian history, his mastery of the tabla and life as a musician would not have been possible. His life’s work is a direct reflection of the political conditions of his time as well as his intense dedication to riyaaz (practice). It is well known that the musicologists mentioned above, Palushkar and Bhatkande, had certain agendas in creating new arenas (i.e., music schools, something unheard of before their time) for Hindustani music while, consciously or not, taking power away from its current culture bearers: hereditary musicians of Muslim families. As Bhakle posits in her book though, hereditary musicians were extremely aware of these moves and were keen to adopt strategies that would allow them to continue as culture bearers. Even though music schools began to spring up everywhere in India in the late nineteenth and earlytwentieth centuries, the fact of the matter was that the true performers of the day were still shaped and “created” by hereditary masters of Muslim descent. There was a period, which Dawood Khan comes out of, when these hereditary musicians began teaching students outside of their family. This is in conjunction with many other changes India was going through at the time, e.g., issues of caste, independence, world affairs, education, and religion alike. If the relationship with a teacher and student is sincere and following the tradition of Hindustani music, they share level of interaction that is not unlike—and in many cases resembles exactly—that of a father and son. Consequently, it is very rare for any student of Hindustani music to have multiple gurus, which is one thing that makes Dawood Khan Sahib so unique: he had five different gurus throughout his life. His first guru, Ustad Khasim Khan, was a zamindar (landowner) in the city Dawwod Khan was from, Sholapur, and held weekly musical gatherings at his home. It was here that Dawood Khan developed an interest in studying tabla and at the age of 12 began tutelage under Khasim Khan. During this period Dawood Khan received intense training from his guru, eventually preparing him to accompany many other artists (vocalists and instrumentalists). A technique that has been lost with the new generation of tabla players was Khasim Khan’s innovation to manipulate the bayan (left-hand drum of the tabla) with his thumb. This is a technique (among many compositions) that Dawood Khan acquired during his initial training and utilized in many compositions. It is important to note that Khasim Khan never thought of himself as a professional musician and was not a part of any family of musicians. He always considered himself an amateur who gained some notoriety by accompanying a few famous musicians. From the discussion above, we can see how ideas of music and the transfer of musical knowledge were changing. Initially, Dawood Khan’s training came from outside the hereditary culture bearers of this tradition, and the gatherings he attended were a product of a changing environment from the courts to middle-class homes and small concerts organized for a larger public. Although this is after the time of Palushkar and Bhatkande, it is an indirect reflection of those efforts: Hindustani music was becoming (or perhaps already was at this point) an enterprise that was taking place in multiple venues and was enjoyed, studied, and taught to many people. It was no longer an exclusive art form. As Ustad Shaik Dawood Khan gained more and more notoriety for his tabla playing in Sholapor (a small city in the neighboring state, Maharashtra), he began being called to Hyderabad radio. Consequently, in 1937, because of the frequency of his appearances on the then privately owned radio station (months after his arrival the radio station was taken over by the Nizam and was subjected to state rule), he shifted his residence to Hyderabad and became a disciple of Alladiya Khan. Now in Hyderabad, Dawood Khan continued to flourish in all aspects of tabla: learning, performing, and teaching—he was even teacher to one of the Nizam princes. This is an interesting shift in the tabla player’s patronage that began to occur in Ustad Dawood Khan’s generation. Emphasis on patronage by princely courts was slowly eradicated because of the fall of Mughal courts beginning in 1857, forcing all musicians to find new sources of income. The reason why a Hindustani musical culture thrived in Hyderabad was not only because of the Nizam’s love for the music itself, but also because his was one of the only courts in India with that much political staying power. Ustad Dawood Khan then (among others), represented a new generation of tabla players that entered a musical world devoid of its previous patterns of patronage. 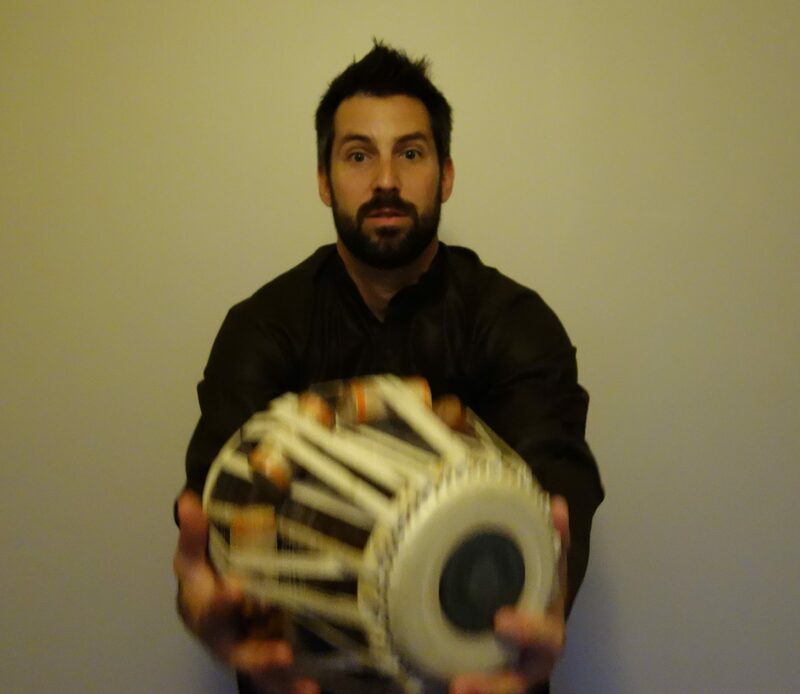 Dawood Khan’s son, Shabir Nisar, suggests that this was also the generation that represented the pinnacle of tabla performance ending in the 1970’s. The musicians of this generation inherited from their courtly forbearers the capacity for long periods of intense practice, and they now shared their dazzling virtuosity with the general public. Their ability to communicate at such a high artistic level undoubtedly led critics and audiences to regard them as the very summit of this tradition. Ustad Shaik Dawood Khan was part of this new generation of tabla virtuosos and contributed greatly to the evolution of the instrument in many ways. Ustad Dawood Khan had three other teachers, the first two were the sons of Ustad Alladiya Khan: Ustad Mohammed Khan, Ustad Chote Khan, and Ustad Mahbood Khan. His last teacher (Ustad Mahbood Khan) was first a close friend of Dawood Khan’s whom together they would share compositions with. He only became a disciple of his when his friend’s father wanted there to be some concrete evidence that Dawood Khan learned from him. Shabir Nisar, Dawood Khan’s son, said that his father learned 57 rare gats (a type of composition) from Ustad Mahbood Khan. Shabir Nisar told me that his father, Ustad Shaik Dawood Khan, would complete two to three chillas a year. A chilla is a period of forty days during which a musician practices ten to twelve hours a day, doing nothing else. It is a complete immersion in one’s art, which musicians today are encouraged to do at least once. In his fifties, the Ustad continued his commitment to practicing ten hours a night, and not sleeping until 4 a.m.. By the age of 40, his teeth were gone because he refused to get enough sleep due to his drive to practice. In his 60’s, even though his health was declining, he would practice up to three to four hours a day. The Ustad would always practice in front of a mirror, but only so he could see his hands. He was very particular of both his hands and sitting position and constantly maintained to himself and his students that their hands could not be allowed above a certain height. Ustad Dawood Khan always said that any real tabla player should not have calluses, and he would allow anybody to inspect his hands upon making this statement. I have heard Khan Saheb many times, but this small clip blows my mind… he is truly the most lyrical sitar player alive today. I have heard few renditions of Bhairavi that are as deep as this two minute clip here. I wish there was more of this concert posted on youtube, but this will have to do. I have had the amazingly fortunate opportunity to sit with Khan Saheb on stage a few times now, and I am constantly in awe and appreciation to know him and be in his presence. I read that Bade Ghulam Ali Khan has asserted that Bhairavi originated in the folk tunes of Iran. I would love to know if anyone else knows more about this. I had my first paid gig in India yesterday (for a wedding). The musicians are apart of a group called “Rajasthan Roots,” and they are excellent. 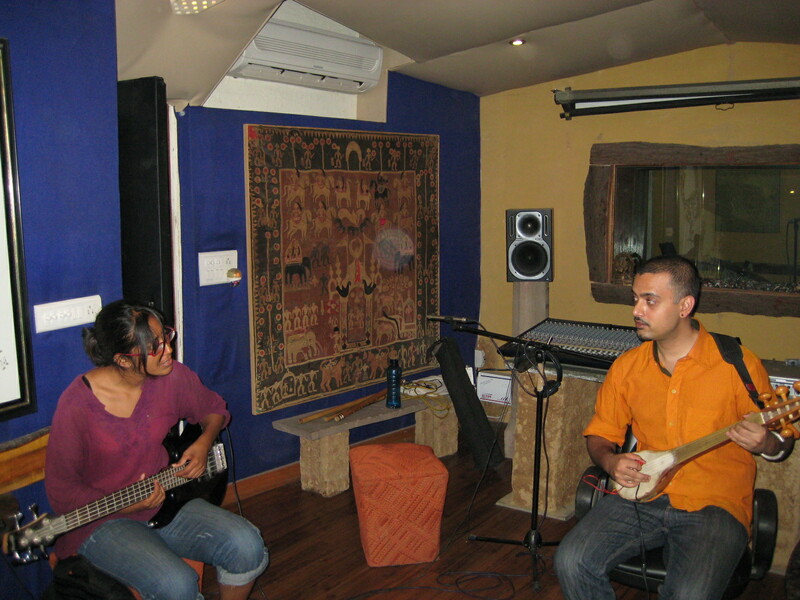 The photo here was taken after a rehearsal in Morchang Studios–a studio owned and ran by one of the founding members of Rajasthan Roots. I have a couple of pictures of the gig we did yesterday but they were not of us playing (I will post them soon!). There were six musicians total: bansuri (flute), morchang and other percussion, vocals, dotara (two string plucked instrument), bass, and drums. The vocalist and percussion player come from a family of folk musicians just outside of Jaipur, and they definitely carry the group. We are talking about doing a whole album together, so we will see what happens. In any case, our next gig is this Friday and is an actual concert. I will definitely be sure to get pictures of us playing this time!